This weekend my husband and I went to do a few old-timey western things for my birthday. 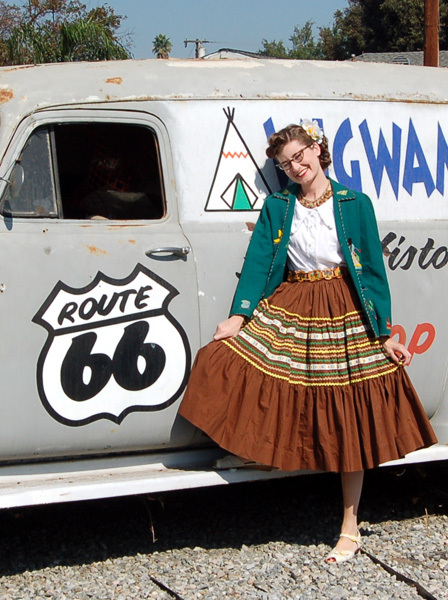 Although not everything went as we had planned or would have liked, we did get to stay at the Wigwam Motel and see Wanda Jackson play sunday night, which was awesome. Wanda Jackson is amazing and her voice is still absolutely incredible. I could not believe it when this 70+ woman belted out the longest stream of amazing western yodels I’ve ever heard live in my entire life. 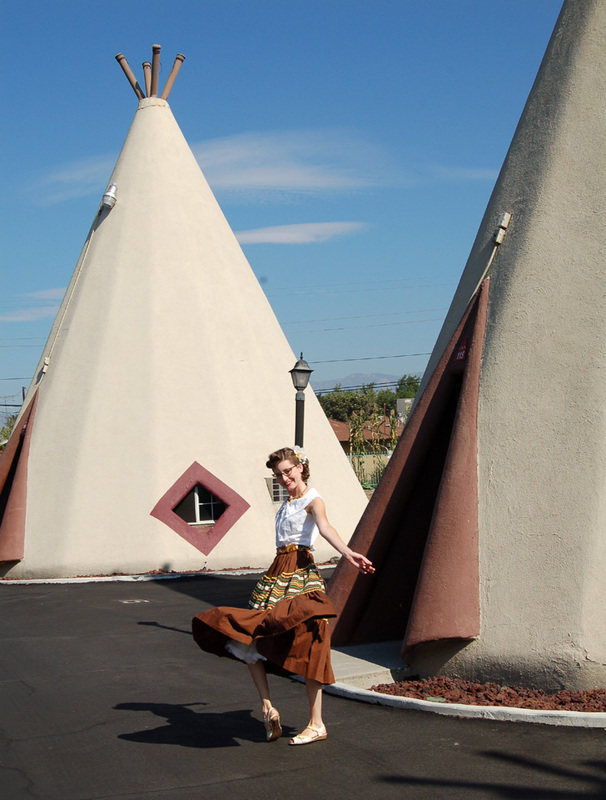 The Wigwam Motel is a funny conglomeration of hokey roadside attraction and hotel on the historic Route 66. The family that owns it are really nice and lovely, very friendly, and helpful giving directions to places we wanted to go. The area around it is pretty sketchy. I was glad my husband was with me. I think if we went back again we’d get there before dark. 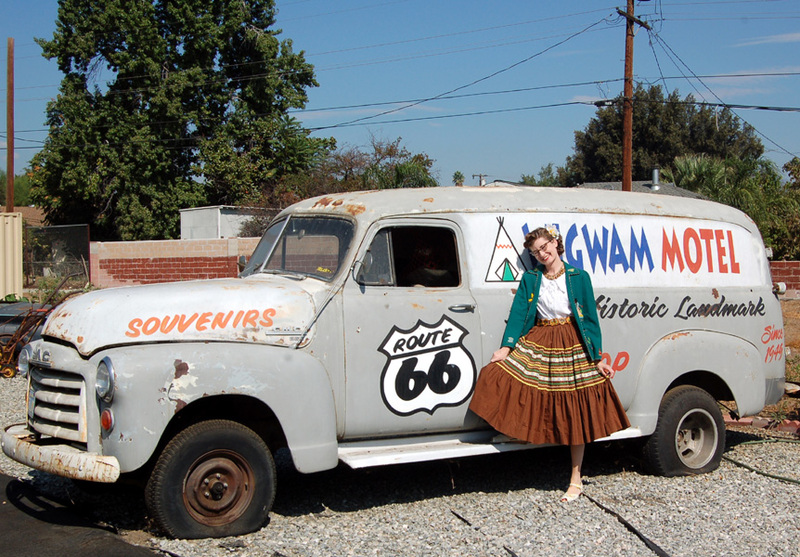 But I’d always wanted to see some of old Route 66, so it was a fun, if interesting experience. 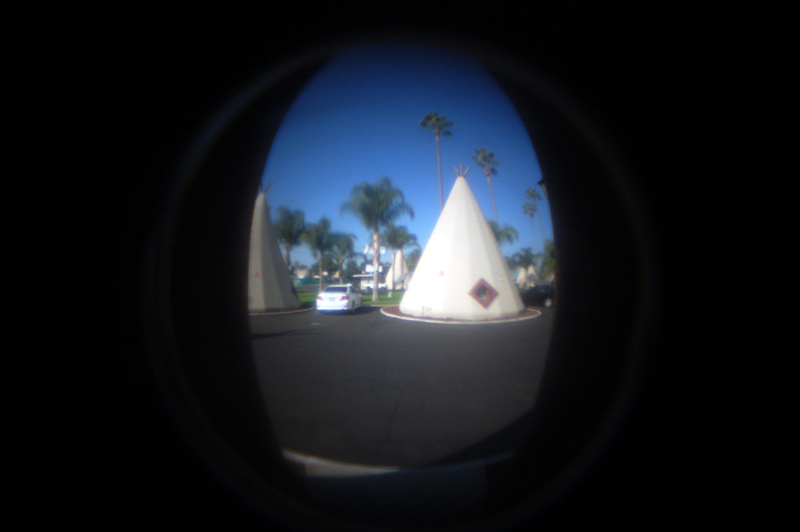 The rooms inside were somewhat modernized and funnily shaped (well, they ARE in fake teepees) so I felt somewhat Alice in Wonderland and out of proportion with a very tall bed in a somewhat rounded room. It was clean but definitely shows its age, but the fun tile in the bathroom, even if a bit distressed, was all original as far as I can tell. And for vintage lovers it’s the little glimpses at the past that are fun! >It looks like it was fun. I just love that skirt – full skirt wheeeee! REally lovely & it suits you so much. 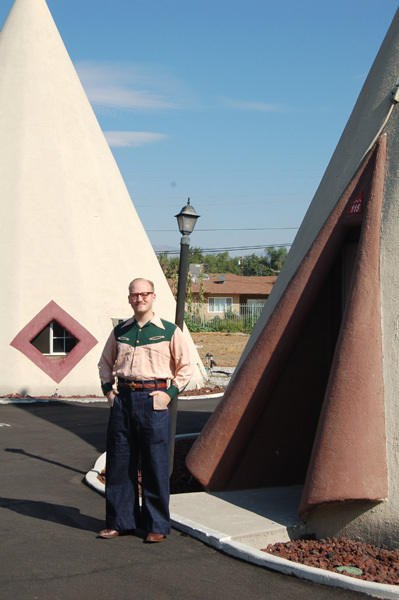 >There's a tee-pee motel in Wharton, Texas, too. Wharton is west-southwest of Houston, though, so you're unlikely to pass that way unless you're on the road to, um, Victoria or Corpus Christi or somewhere further down the coast.And if you're ever in St. Francisville, Louisiana, try to get a cabin at the 3V Tourist Court. 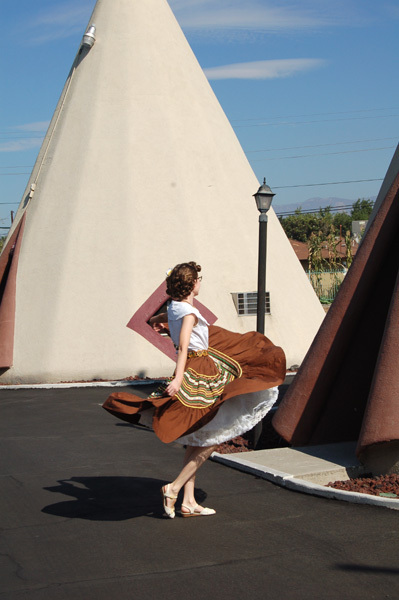 Not wigwams, but still very cute, and the oldest remaining motor-court motel in the state. 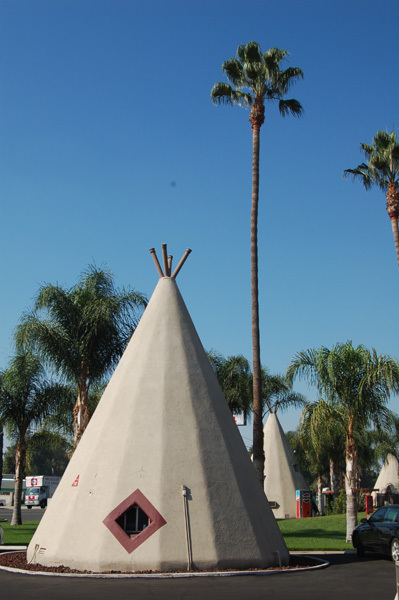 >i'd always wanted to stay there when i lived out in the inland empire! what fun!! >What a cute hotel! If I ever get a chance to get back to Ca, I have to stay there! >What a wonderful trip. I would love to hear yodeling like that. Lovely skirt to spin in.Hope you feel better soon and happy birthday. >You two look fantastic. That's AMAZING that you made your hubby's jeans…but then all your creations are spectacular! >You literally look like your fell through a time portal. Gorgeous. Simply gorgeous. >I should have added: Wanda Jackson rocks. Literally. She's amazing. >How fun!!! You look so adorable.